I consider myself an "Honorary Cebuano" because I lived there for such a long time. I started school there at Grade Three, and finished high school there. I never really did get the hang of the dialect, but I still know enough to get by. Since I was living there in the late 80's and early 90's, living in Cebu was really like you were living in the province. (When people ask me "Lumaki ka ba sa Cebu? ", I answer with "Sa Cebu ako HINDI lumaki") There wasn't cable television yet back than, and there sure as hell wasn't internet. Even regular TV was one week delayed! There weren't any Malls yet either, so there were actually only two Movie Theaters in Uptown Cebu worth going to, Belvic and Century 21. When Gaisano Country Mall and SM Cebu opened in my senior year of high school, that pretty much marked the modernization of the city. Looking back at it though, I had so much fun growing up there, I never felt I was missing out on anything. One of my first memories of Cebu was my dad taking me to the restaurant known as "Golden Cowrie". I remember it so well because I had honestly thought it was a carenderia or something to that effect.. small holes in the wall that my dad seems to love. It wasn't air-conditioned and the flooring was made of stones laid out on the ground. 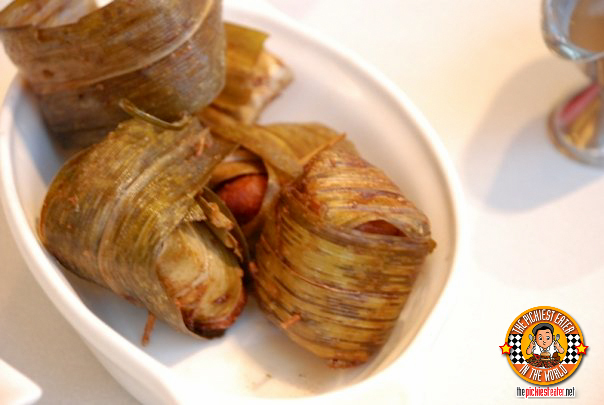 Plus we had to eat in plates that sorta looked like small baskets with a banana leaf laid on top. I'm not being elitist, or anything like that - But as I child, this was my first experience of full blown Filipino dining. And it was the very first time I could actually remember eating the food that would be a huge part of my becoming the (fat) man I am today - Liempo. And I honestly couldn't have asked for a better experience. 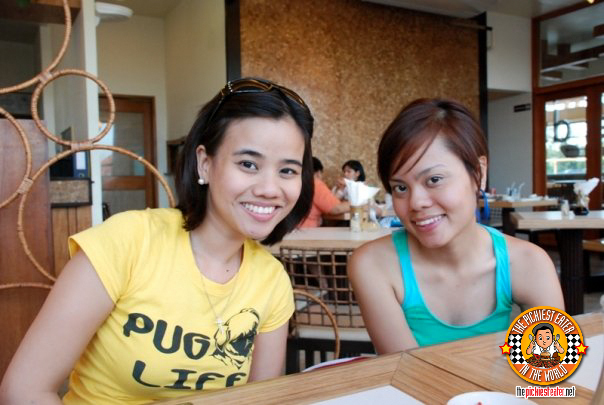 When I went to Cebu with Rina and her friends Lia and Camille, I told her that a trip to Cebu would not be complete without a stop at Golden Cowrie. I raved to her about them having "The Only Baked Tahong That I Eat". As you can surmise, It's not a usual thing for me to eat that sort of thing, but Golden Cowrie's Baked Tahong blends their garlic, butter and cheese so perfectly it's pretty hard to resist. Unfortunately for us, since we went to Cebu during the Holy Week Celebration, the original branch in Lahug was closed, with it being a Maundy Thursday. The guard on duty told us to check the other branch at Ayala, which could possibly be open. 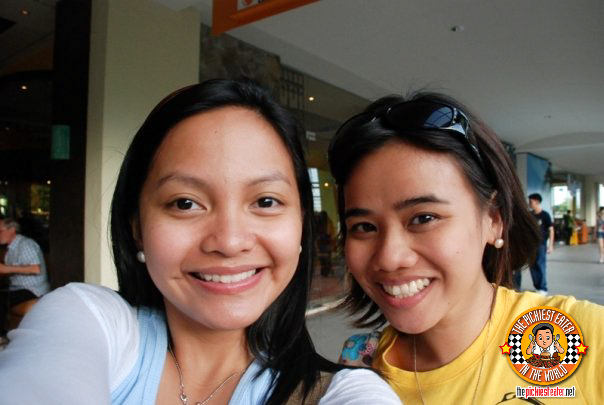 We drove over to Ayala Terraces, and I was absolutely spellbound. This was nothing like the Cebu I grew up in. 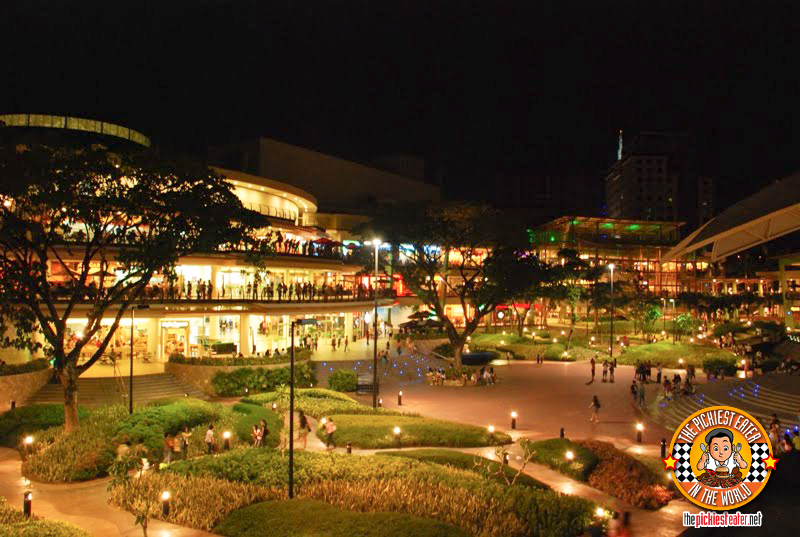 The Ayala Center of Cebu can certainly stand toe to toe with some of the best malls in Metro Manila. I was just thinking to myself, "Why couldn't we have had this when I was living here?!". It took us a while to find the place, simply because we were looking for Golden Cowrie, and the place was called "Hukad" by Golden Cowrie. Why they felt the name change was necessary is beyond me, but for as long as the food is good, they could call it "Uncle Fred's Dirty Underpants Cafe" and it wouldn't matter to me. (But thank god they didn't call it that) We got seated, and considering we got there early (around 6pm) It was already quite full. From what i gathered, the place had just opened recently so there were a few kinks in the service. Looking at the menu, it's essentially the same thing as Golden Cowrie, except in classier digs, but the price was very reasonable. In fact, it's practically a steal! 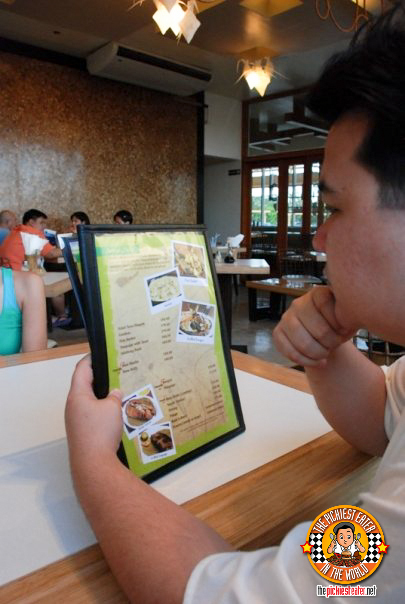 After taking a closer look, however, I realized something important in the menu was missing.. I scoured the list of food dishes available with a fine tooth comb, and was extremely disappointed to find that "Hukad" doesn't serve Baked Tahong. Only "Golden Cowrie" does. How stupid is that? It is one of their main attractions in their already awesome arsenal, so why hold that back? I was honestly more disappointed for Rina, because I really wanted her to try it. 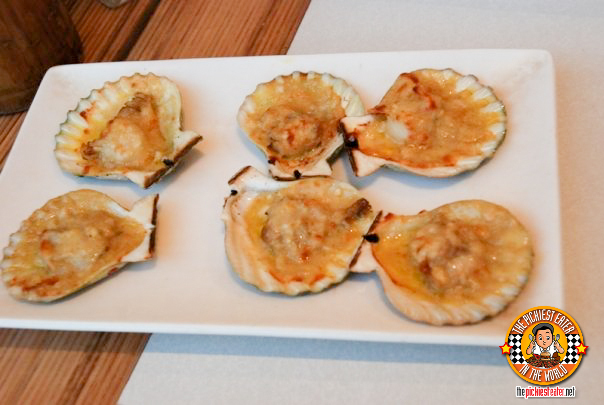 Instead though, Rina was happy to try their Baked Scallops instead. The Baked Scallops.. Or as I called it "The dish that is NOT BAKED TAHONG"
I didn't try it, but Rina, Lia and Camille seemed to really like it. But Rina loves anything smothered in melted cheese. 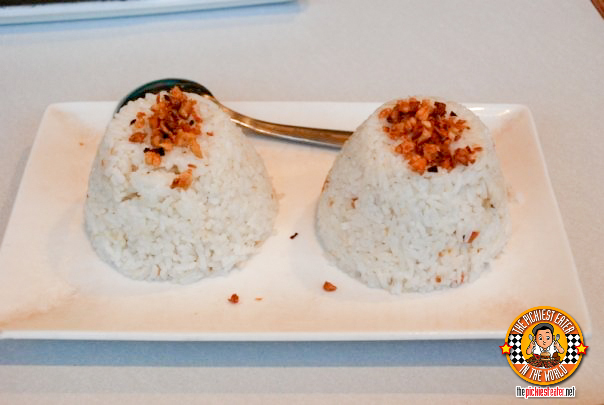 The problem with me eating Filipino food is that I tend to overeat when it comes to garlic rice. Even though i'm not really much of a rice eater, when I eat Pinoy stuff, especially dishes with really good sauces, my stomach is like a bottomless pit! 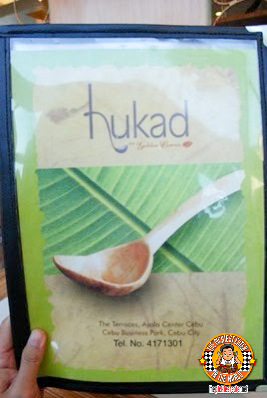 Perhaps the people at Hukad knew that fact about me and designed their garlic rice in such a way that would appeal to me hehe.. 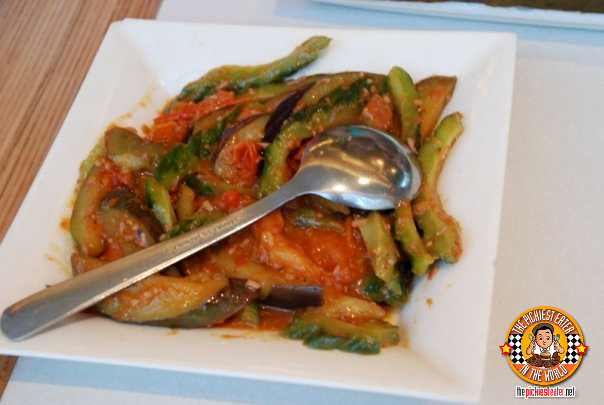 The girls wanted a veggie dish, so they decided on Pinakbet. Again, I didn't try it so I can't really comment on it. The girls, again, seemed to like it, but there were a lot left over. Either they weren't telling the truth or they stuffed themselves with other dishes so much that this one got left out. How do they cut the fish like that?? 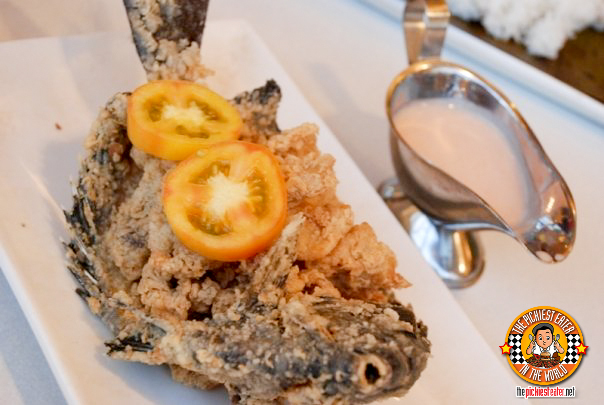 I was really drawn to the Deep Fried Tilapia in Coco Cream dish. As picky as I am, i really do like fish, and this was really quite good. The Coco Cream wasn't what I expected though - for some reason it came out kind of pinkish. Still, when doused unto the crispy Tilapia, it was excellent. The Tilapia was actually fried perfectly and didn't need any sauce to it. Rina ordered the Chicken Pandan - which I found to be ok. I mean, nothing anything out of this world. Maybe it's because it's supposed to be eaten with sweet chili sauce, which I don't eat. But other wise it was a fair tasting piece of deep fried chicken that wasn't dry at all. Flavor-wise, however, it won't blow your mind away. Golden Cowrie's Liempo.. What all Liempos wanna be when they grow up.. I'm ashamed to say that I think I may have eaten this whole plate all by myself. The three girls were chowing down on their veggies, scallops and chicken, and Rina put this plate beside me. I have an eerie feeling the girls were shy to get some because they saw how I was wolfing it down with the fiery passion of a thousand volcanoes. 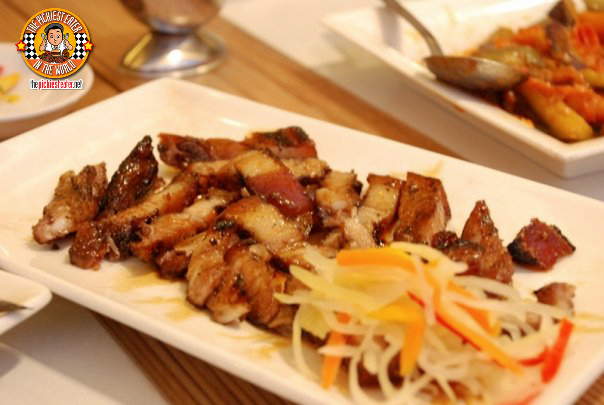 It's really one of the best Liempo's you'll ever try. 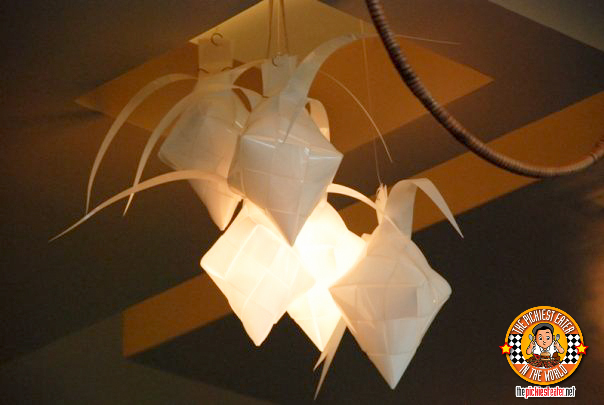 It's perfectly cut to the right size so that when you chow it down, it doesn't feel to heavy on you. And it has the perfect balance of meat:fat ratio. The only other place that can stand toe to toe with this, is also from Cebu, and I'll tell you about it in another post. 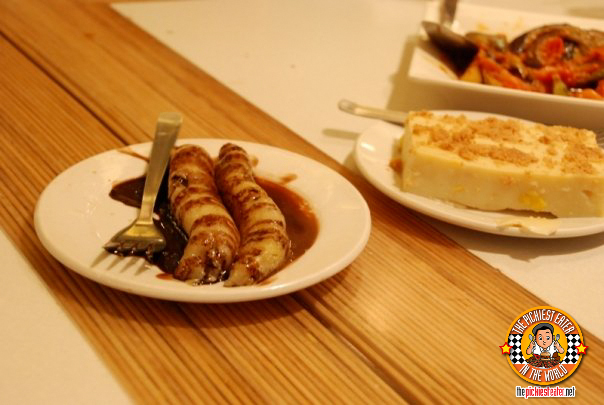 The ladies wanted to try the Suman in Tsokolate, and some other Filipino thing.. Maja Blanca was it? I forget. I didn't like either of them though. Suman is alright, but I don't like the bitter chocolate taste that it was doused in. What's wrong with milk chocolate? hehe..
Golden Cowrie has changed alot since being sold by it's original owners. The group that owns it now obviously has commercialization in it's mind, but i sincerely hope that it's not at the sacrifice of its quality. I went there this year again, (The new Golden Cowrie branch in Mactan), and the service was horrible, but the food was good. I'll probably do a separate post of that experience. But at the end of the day, who am I kidding? I'd always go back for the liempo. "White Gold".. You know you're from Cebu if you know what i'm talking about..